One of the great things about being biracial is being stopped on the street by strangers demanding to know your racial and ethnic heritage. "What are you?" they ask, refusing to take "get away from me, weirdo" for an answer. Or, you know, when you're at work and a customer grabs your arm, leans in close, and whispers, "My daughters and I pay a lot of money for skin as beautiful as yours. You have the type of skin we would kill for." But it's not just white ladies threatening to turn your skin into a suit — there are lots of benefits to being biracial! Like never feeling like you fit in, or feeling like a traitor to your mother's race because all your friends are white, or being mocked by your elementary school classmates when your mother lovingly puts your hair into braids so that you cry and take them out in the bathroom. Karen Finney is having even more fun — did you know that if you're biracial and get hired at MSNBC, other people get to decide your racial identity for you? It's true! 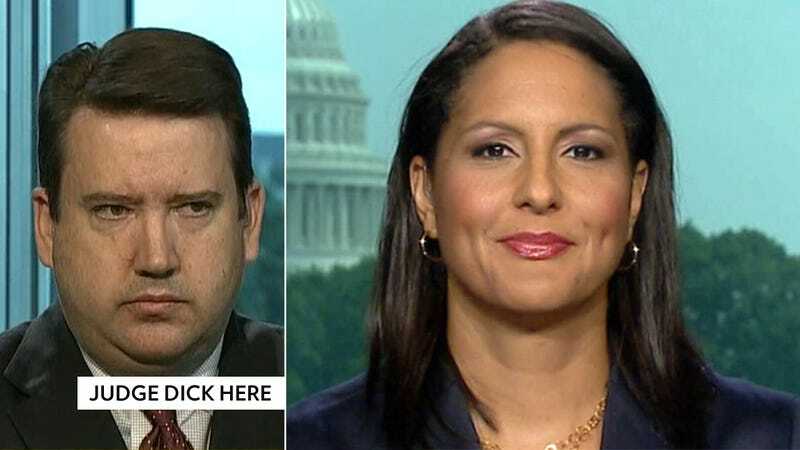 MSNBC recently announced that Finney, former deputy press secretary for Hillary Clinton, will host a new show airing on weekends from 4-5 p.m. Finney is described as "the first African-American spokeswoman for the Democratic National Committee." But how African-American is she? Newsbusters' Tim J. Graham, an expert in determining who is black and who is not, recently did us all a solid and used his male gazin' skills to posit that Finney is simply not tan enough to be black. "MSNBC touting Karen Finney as another African-American host," tweeted Graham. "Would the average viewer be able to guess that? Or is Boehner a shade more tan?" Yes. John Boehner's glistening man flesh is "more tan" than Finney's. By this logic John Boehner is blacker than Malcolm X, my grandpa, and Coretta Scott King combined. But Graham didn't stop at melanin — he later implored his followers to "judge pic here," linking to an article about Finney with a photo so that they could also weigh in on her true racial identity. Yes, white dude. Do tell us more about what it means to look black. It sure is good to know that Finney only qualifies as black as long as the average viewer thinks she does. My skin tone is roughly identical to Finney's — I guess I'm out of the club, too. I'm not sure how to break this to my black mom. Sorry, mom. We had a good run. It was fun while it lasted. Can anyone recommend some sort of "Chicken Soup for the Formerly Black Soul" type book that can guide me through this process of having my racial identity stripped from me by some white conservative jerk who probably still thinks that racism against Irish people is "a thing"? I'm tired of this. The fact that Graham felt qualified to wade into these waters speaks not only to the state of race relations in this country, but to his deep-seated white male privilege. Guess what? "Tim J. Graham" does not get to have a say in this conversation about women and race. Tim J. Graham doesn't get to decide whether Karen Finney's skin tone meets his standards of blackness because Tim J. Graham doesn't get to maintain blackness standards. Graham acts as if he's doing us all some great service by questioning the legitimacy of Finney's diversity bona fides, but this is just the same old tired racism dance. For Graham to minimize the importance of Finney's hire because her race is not "self-evident" suggests that us biracial folks ought to pick a distinct category before we can be taken seriously. Karen Finney gets to be black if she wants because she is black. Regardless of my olive-toned skin suit, I'm still black. Half of my family is black. These are the people who gave me black Barbies and took my brother and me to sit on Black Santa's lap (no line for Black Santa, y'all). I am biracial, and I am black, and Tim J. Turdface Graham doesn't get to take that away from me, or Karen Finney, or anyone else. This issue is deeply personal for me, but Graham's attitude has broader implications for women of color. For a white man to say, categorically, "you are not black, because you don't look black to me," denies women of color the right to take ownership of our bodies and our identities. It evokes deeply painful stereotypes of what is or isn't black and it denies that there is anything unique or diverse about being biracial. Graham's comments explicitly state what many biracial people (myself included) struggle with every day: you don't look like me, you don't look like them, you don't belong anywhere. Graham thinks our choice of identity should be based entirely on outward appearance. The thought of having to "choose" is absurd in and of itself — it is possible to identify and fit in with more than one cultural, racial, or ethnic group. Graham picked a category for Finney (and people who look like her) by ignoring her own statements of self-identification and substituting them with his own flawed judgment. He ejected Finney from a community that he himself does not inhabit. Even more problematically, Graham's tweets reinforce the notion of some sort of monolithic "black culture" that is devoid of nuance, made up of people who look and act the same, and who agree on everything. For Graham, if you don't fit into his preconceived ideas of racial identity, you don't belong. But there's no singular way to "be black." Finney represents one of a zillion ways — even if she doesn't have a standing weekly appointment at her local tanning salon. Meagan Hatcher-Mays is a third-year law student at Washington University in Saint Louis. She teaches "Women & the Law" to a group of brilliant undergraduates. She yells a lot on Twitter.